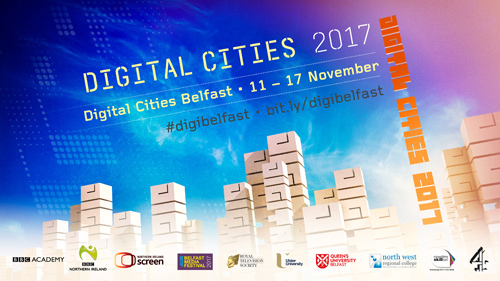 Digital Cities Belfast runs from Saturday 11 November until Friday 17 November with a series of free events and workshops across the city aimed at developing digital skills, sharing knowledge and creating networking opportunities for the city’s creative and digital sector. A Digital Cities Londonderry Day is also running during the week. The BBC Academy, supported by BBC Northern Ireland, has teamed up with Northern Ireland Screen, Ulster University, Queen’s University Belfast, Belfast Media Festival, the Royal Television Society, BBC School Report, the North West Regional College and Google Garage amongst others to create a number of activities including practical hands on workshops, masterclasses and conference-style events. Joe Godwin, Director, BBC Academy says: “This is an exciting time for Northern Ireland’s already growing creative economy. Digital Cities Belfast is a real chance for people working in the creative and digital sector to meet up, share ideas, forge new partnerships and learn something new. “We thank all our partners for their collaboration to creating such a fantastic schedule of events and workshops for Digital Cities Belfast and delighted this will also include a Digital Cities Derry Day”. Digital Cities Belfast has a packed programme of events including a two-day Hackathon, School Report Day, digital skills training by GoogleGarage, a RTS Futures creative industry careers day and a BBC Academy Skills Day with free training for both experienced professionals wanting to enhance their digital skills and new entrants to digital production. Emma Dunseith, Executive Producer, Digital and Learning, BBC Northern Ireland said: “Digital Cities Belfast is an opportunity for collaboration between broadcasting, the digital and creative sector with a view to developing the creative sector here in Northern Ireland. We are delighted to be working with BBC Academy and their Partners in bringing BBC Digital Cities to Northern Ireland”. The week-long event will run alongside the Belfast Media Festival which takes place on 16-17 November. The BBC Academy, supported by BBC Northern Ireland, has teamed up with partners including Northern Ireland Screen, Ulster University, Belfast Media Festival, the Royal Television Society, BBC School Report, the North West Regional College and Queen’s University Belfast. Additional partners involved in the running of the week include Games NI, ProductTank, Film Hub, Cinemagic, IntoFilm and Belfast City Council. Digital Cities Londonderry/Derry Day is being hosted by the North West Regional College. Highlights of the Belfast Media Festival include a writing masterclass from Line of Duty’s Jed Mercurio, a C4 session on fake news with Jon Snow and Dee Forbes the Director General of RTE, will outline her strategy for the channel.